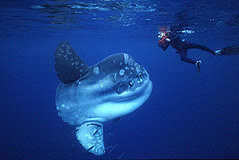 The ocean sunfish (mola mola) is the largest bony fish in the world. 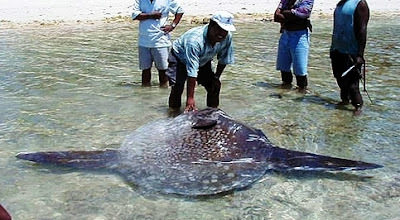 It is a unique pelagic fish, and specimens of ocean sunfish have been observed up to 3.3 m (11 ft) in length and weighing up to 2,300 kg (5,100 lb). Curiously, the Ocean Sunfish has a very small brain compared to its size: A 200 kg specimen may have a brain the size of a nut weighing only 4 g. It would explain their quiet behaviour and how often they get trapped into fisher nets. According to the National Geographic if it lives to adulthood, a sunfish can gain over 60 million times its starting weight: "the equivalent of a healthy, bouncing human baby growing to a weight equal to six Titanics". 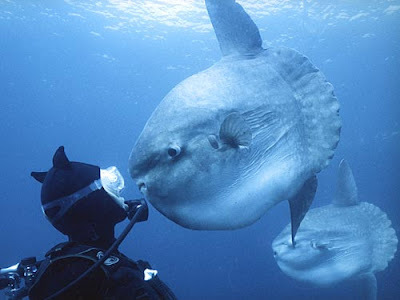 The images of scuba divers next to a giant sunfish gives us a better idea of their incredible size. Fortunately, ocean sunfishes float serenely in midwater. 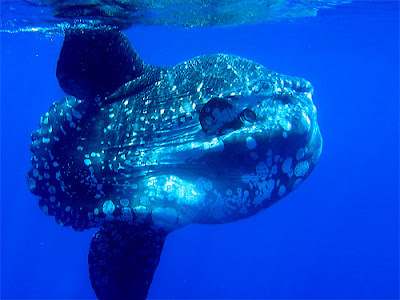 Ocean sunfish is generally thought to be solitary fish, swimming freely in the ocean alone. However, certain sightings of molas in groups of more than ten have been reported. 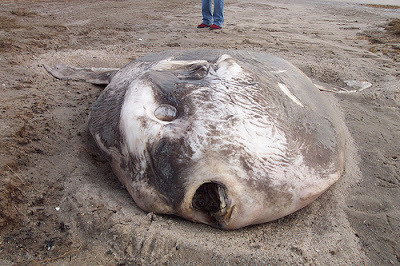 Frequently, giant sunfishes lie inert on the ocean surface, apparently sunning themselves. 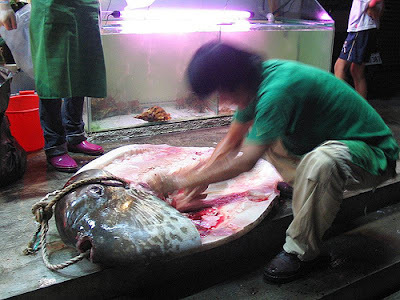 Sometimes, ocean sunfishes are caught accidentally by fishers nets and a crane is needed to lift them on board. Another threat to ocean sunfish are floating plastic bags which look like their natural prey, jellyfish. 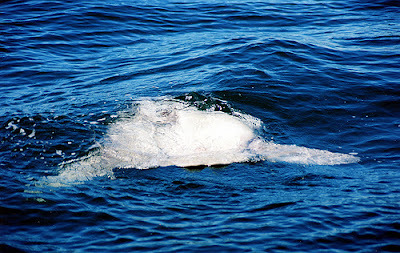 Sunfish can choke as they try to swallow the bags, or slowly starve as the plastic clogs their stomach. 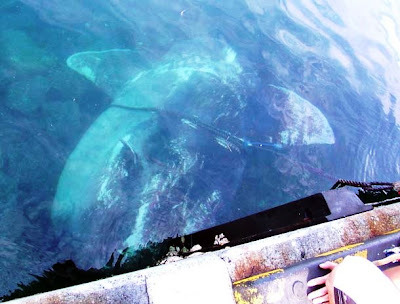 Recently, a Gaza fisherman trapped a giant sunfish. He threw his nets into the water and was surprised when the fish got stuck in five of his nets. 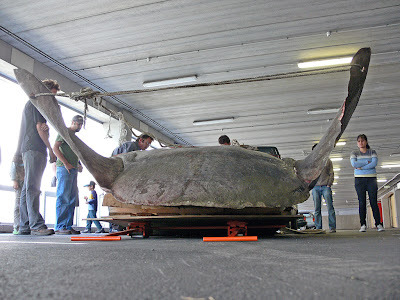 His catch measured 3.5 metres or 11 feet in length, 1 metre in width and weighed one tonne. Many fishers have lived the same experience, and it seems pretty impressive. Some years ago, Australian Museum acquired such a large specimen that they had to use ropes to haul it up and get it inside the building through a window. 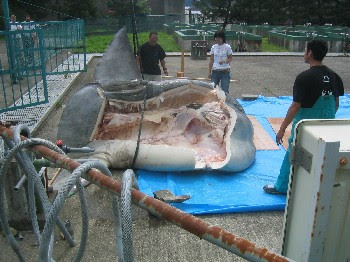 As you can see, the size of other specimens is as big as a parking place. 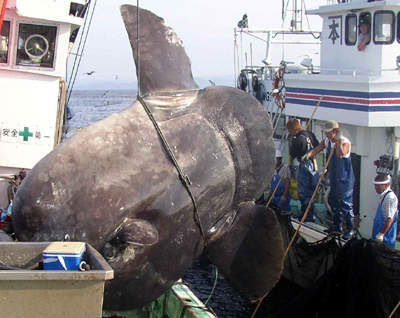 On the other hand, giant sunfishes are an important menace for little ships. A collision at high speed can cause both injury to sailors and damage to yachts. 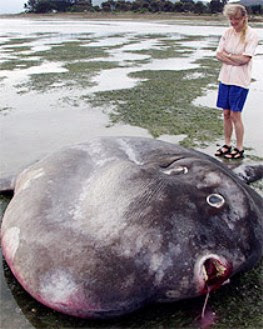 Finally, the flesh of the ocean sunfish contains neurotoxins similar to those of other poisonous tetraodontiformes, but it is considered a delicacy by some people. Whoa! This incredible! Thanks for the awesome post! Nature is amazing! 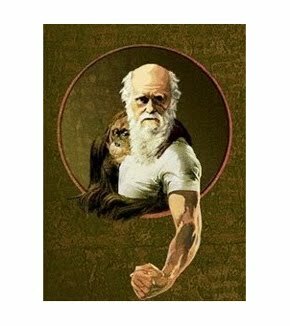 A great collection of images you've got here. Why does the diver in the first photo have *horns* on his wetsuit? This page is a rip off of the wikipedia article with a few images thrown in. these fishes are like.. HEEEUUGE. gawd. great entry! No it isn't. You would have notice if you had read longer than the first paragraph. Anyway, I spent many hours writing this post. How much time did you spend on writing your coment? Thirty seconds? 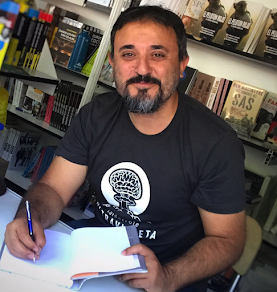 Yiannis Goutis, the owner of http://www.startpoint.gr/ makes makes money out of your posts systematically. Why they killed it? Damn monsters, let the fish live!! It's incredible! It's huge! If I saw one at llive time it's possible that I would be scared. Fantastic! 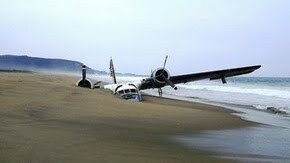 I would not like to hook one of those while fishing! 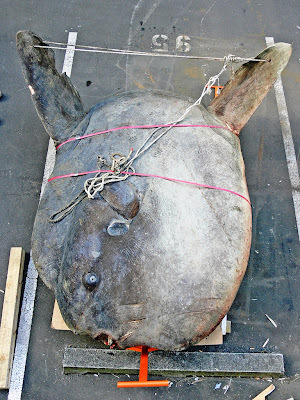 You don't use my copyright on my Mola Mola picture. You have cropped it !!! NO GOOD ! 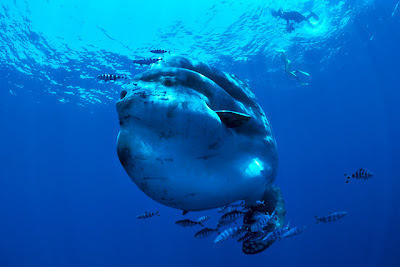 Please put my copyright in my picture or take off my Mola Mola picture. Sorry, take a look now. The picture links to your web.  It´s a marvelous and fantastic fish. I love nature. I love the life. 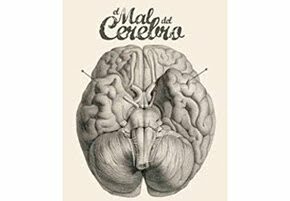 good article and great images! 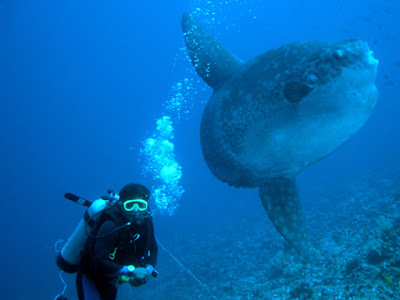 Juni until September you can found mola mola sunfish in bali . . .